Foreign Minister Avigdor Lieberman said Polish President Lech Kaczynski, who was killed in a plane crash Saturday along with at least 130 others in Russia, was a "true friend of the State of Israel and proved this through his actions and positions, as well as through his important role in creating good strategic relations between Israel and Poland." Defense Minister Ehud Barak expressed his "deep sorrow" over Kaczynski's death. "The Polish president was a great friend to Israel, and his death is a great loss to his nation and the entire world," he said. President Shimon Peres sent his condolences to the Polish people. "The death of my friend, president Lech Kaczynski, as well as the death of his wife Maria and other senior officials in Poland's leadership, shocks and pains us. "Israel bows its head and grieves with you (the Polish people) over this loss," he said. Prime Minister Benjamin Netanyahu also sent his condolences to Poland. "I knew president Kaczynski as a Polish patriot, a great friend to Israel and as a leader who worked for the good of his people and for the advancement of peace and prosperity in the world," he said. "We last met in Warsaw in January, during the events marking 65 years since the liberation of the Auschwitz concentration camp," Netanyahu recalled. "President Kaczynski led the opening of a new page in the relations of the Jewish and Polish nations. He also advanced the relations between Poland and Israel. "I bow my head along with all of Israel's citizens over this great loss for all freedom loving nations," said the PM. Former Israeli ambassadors to Warsaw remember Kaczynski as someone who supported Israel, even when other European countries did not. "I knew Kaczynski well from the time he was mayor of Warsaw. During his term as mayor he visited Israel for the first time. When he returned he said he felt like home in Israel," said David Peleg, who served as ambassador to Poland between 2004 and 2009. 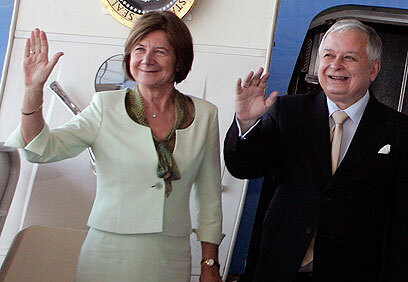 Peleg told Ynet that during Kaczynski's presidency Polish-Israeli relations improved, adding that he was very sensitive to issues related to Judaism. "He was among those who initiated the construction of the Museum of the History of Polish Jews, which will stand opposite the Warsaw Ghetto memorial. He was a staunch supporter of Israel, particularly regarding the Iranian issue. This is definitely a great loss," said the former ambassador. Peleg said Kaczynski's wife, Maria, visited Israel many times and contributed to the cultural ties between the countries. "As a former ambassador, this tragedy is a shock for me. He (Kaczynski) was one of our greatest allies; he did not hesitate to speak his mind," said Peleg. Yossi Levy, a former deputy ambassador to Warsaw, told Ynet that the Polish president was "a great friend to Israel and the Jewish nation since his days as mayor of Warsaw and even more so throughout his presidency. "He contributed greatly to the friendly dialogue between Poles and Jews. I remember that following his election in 2005 he said during a television interview that his hero is (former Israeli Prime Minister) Ariel Sharon," said Levy. See all talkbacks "Lieberman: Polish president was true friend of Israel "